On the morning of June 4, 1942, high above the tiny Pacific atoll of Midway, Lt. (j.g.) “Dusty” Kleiss burst out of the clouds and piloted his SBD Dauntless into a near-vertical dive aimed at the heart of Japan’s Imperial Navy, which six months earlier had ruthlessly struck Pearl Harbor. The greatest naval battle in history raged around him, its outcome hanging in the balance as the U.S. desperately searched for its first major victory of the Second World War. Then, in a matter of seconds, Dusty Kleiss’s daring 20,000-foot dive helped forever alter the war’s trajectory. Plummeting through the air at 240 knots amid blistering anti-aircraft fire, the twenty-six-year-old pilot from USS Enterprise’s elite Scouting Squadron Six fixed on an invaluable target—the aircraft carrier Kaga, one of Japan’s most important capital ships. He released three bombs at the last possible instant, then desperately pulled out of his gut-wrenching 9-g dive. As his plane leveled out just above the roiling Pacific Ocean, Dusty’s perfectly placed bombs struck the carrier’s deck, and Kaga erupted into an inferno from which it would never recover. Arriving safely back at Enterprise, Dusty was met with heartbreaking news: his best friend was missing and presumed dead along with two dozen of their fellow naval aviators. Unbowed, Dusty returned to the air that same afternoon and, remarkably, would fatally strike another enemy carrier, Hiryu. Two days later, his deadeye aim contributed to the destruction of a third Japanese warship, the cruiser Mikuma, thereby making Dusty the only pilot from either side to land hits on three different ships, all of which sank—losses that crippled the once-fearsome Japanese fleet. By battle’s end, the humble young sailor from Kansas had earned his place in history—and yet he stayed silent for decades, living quietly with his children and his wife, Jean, whom he married less than a month after Midway. Now his extraordinary and long-awaited memoir, Never Call Me a Hero, tells the Navy Cross recipient’s full story for the first time, offering an unprecedentedly intimate look at the “the decisive contest for control of the Pacific in World War II” (New York Times)—and one man’s essential role in helping secure its outcome. Dusty worked on this book for years with naval historians Timothy and Laura Orr, aiming to publish Never Call Me a Hero for Midway’s seventy-fifth anniversary in June 2017. Sadly, as the book neared completion in 2016, Dusty Kleiss passed away at age 100, one of the last surviving dive-bomber pilots to have fought at Midway. 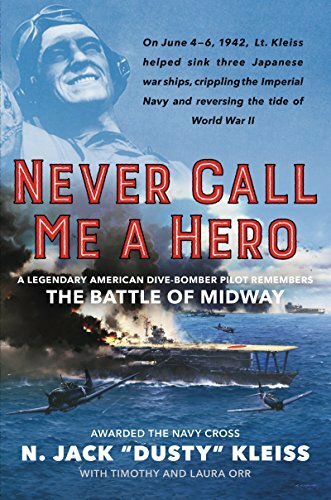 And yet the publication of Never Call Me a Hero is a cause for celebration: these pages are Dusty’s remarkable legacy, providing a riveting eyewitness account of the Battle of Midway, and an inspiring testimony to the brave men who fought, died, and shaped history during those four extraordinary days in June, seventy-five years ago. I have been wanting to get this book for a while and I finally got it at Costco because it was way cheaper than anywhere else I’ve seen it. I loved reading about Dusty and his memories of World War II. He as an amazing story which is very well written. I believe that his story is one of my favorite World War II stories and I cannot believe how much I enjoyed it. There was normal war elements in this book: language, violence, etc. This also has some good history on airforce and the navy which is another element I enjoyed in this book.